LAHORE – National Highway and Motorway Police (NH&MP) and Niazi Transport Company (pvt) Limited (NTC) are wrestling over ownership of about 20 kanals near Motorway’s Babu Sabu Interchange, Pakistan Today learnt on Monday. NH&MP authorities claim that the National Highway Authority (NHA) had allotted 51 kanal piece of land to the NH&MP for the construction of its camp office adjacent to Babu Sabu Interchange at the Motorway. NH&MP officials claim that they have already begun civil work for NH&MP’s camp office development at aforementioned place. NH&MP’s camp office building is almost near completion with a covered area of about 43,000 square feet, but NH&MP officials came to know that about 20 kanals of the allotted land was under NTC’s possession, where the company was parking its vehicles. NH&MP officials claimed that they immediately contacted NTC to vacate the occupied piece of land but they never followed their directions, over which NH&MP officials requested NHA to allot them the land. NH&MP officials said upon their request, NHA officials contacted NTC owners but NTC refused to vacate the area and claimed that they have parked vehicles over there with Punjab Government’s directives. NH&MP officials claim that these buses were a source of permanent nuisance and risk for the complex construction site workers. They said these buses were parked at about 20 feet above complex construction level and several times these buses have caused injuries to several workers after rolling downwards due to brake failure. NTC owner Azam Khan Niazi said, “The company can not think of illegally occupying government’s land. 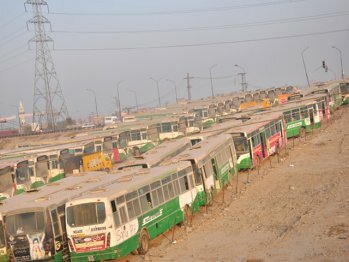 NTC has taken NHA’s permission for temporarily parking their buses over that land till allocation of some other parking place by Punjab Government, which has been promised by Punjab Government on numerous occasions. Whenever NHA authorities ask, NTC will vacate the land.” He further added that the company itself was facing losses by parking vehicles in the open. However NH&MP Lahore Zone spokesman Syed Imran Shah refuted Azam Khan Niazi’s statement, counterclaiming that the NHA had not allowed Niazi Transport a temporarily bus parking. He claimed that NHA had sent several notices to NTC to vacate the land but the company had not paid heed to the notices. NHA General Manager Shahid Ihsan said that the given information might be true but he could not comment on the matter without the NHA Chairman’s consent.